Surprising Ant Facts | Greenleaf Organic Pest Management, Inc.
Ants are relatively tiny insects compared to some of the other types of pests that may infest your house. It may be somewhat surprising that such small pests can cause such big problems and can be so difficult to get rid of. However, ants are hardy and resistant to do-it-yourself attempts to get rid of them for a reason. Take a look at some surprising facts about ants that may explain why they're such a resilient pest. When researchers used DNA sequencing to trace the ant family tree, they found something surprising: ants are much older than previously thought. The insect originated between 140 and 168 million years ago, although they only began to diversify about 100 million years ago. This means that back when dinosaurs roamed the earth, ants were there as well. However, the extinction-level event that wiped out dinosaurs, as well as many other animal species, failed to get rid of the ants. If ants could survive when dinosaurs couldn't, you should not be surprised that they can resist your attempts to root them out of your home. Most people know that ants live in colonies and work together, but the extent of the cooperation shown by ants when they're threatened may surprise you. When an ant colony is threatened, the ants can form what is referred to as a superorganism where the ants all act as one organism to protect the colony. Scientists compare it to the way you might yank your hand off of a hot stove if you touched it accidentally. The nerves in your hand would relay the painful sensation to your brain, and your body would respond accordingly, moving away from the source of the pain. A group of ants can display this same coordinated response as if it were one body instead of many. The colony doesn't necessarily have to be reacting to a human or animal predator threatening the colony for it to act as a single super-ant. In flooding that happens in the wake of a natural disaster, floating rafts of ants have been observed in the flood waters. The ants, sensing that their colony is about to be destroyed will link themselves together using hooks on their legs until they form a large ball that's capable of floating. The worker ants will be on the outside, and the queen and any eggs or larvae will be in the middle, protected from the waters. As you might imagine, running into one of these floating mounds of ants is bad news. If you're ever in a flood, try to steer clear of floating ant rafts. This just goes to show you how far the colony will go to protect itself and its queen. You probably know that the queen ant is the head of the colony. She handles all of the reproductive duties. As long as she's around, the colony will probably survive. Kill some worker ants and she'll produce more, but if you kill the queen the colony will fold. What you may not realize is that it's not always easy to kill the queen because there may be more than one queen. In new colonies, multiple queens allow for greater production of workers, which can help ensure that the colony survives. When the worker ants are ready, they will kill off the extra queens until only one remains. Occasionally, they go too far and kill off all the queens, dooming the colony. Don't count on worker ants to do the job for you if you have an ant infestation in your home or yard, however. If your new infestation has multiple queens, you may find that the ants are even harder to get rid of than anticipated. At first glance, ants don't seem like a particularly messy bug. On the contrary, they'll carry away crumbs and moisture that they find in your house, and may not seem to leave much behind. However, if you have an infestation, you may notice multiple ants walking along in a perfectly straight line across your floor. They aren’t taught to walk in line like a classroom full of kindergarteners. They're following an invisible trail made of pheromones. First, ant scouts go out to locate food sources. They lay down the initial pheromone trail. Then the worker ants simply follow the scent to find the food and carry it back to the queen. You can temporarily confuse the ants by cleaning the scent of the trail away, but they'll just lay a new o. The better course of action is to observe the trails and let your pest control technician know where you've seen them. 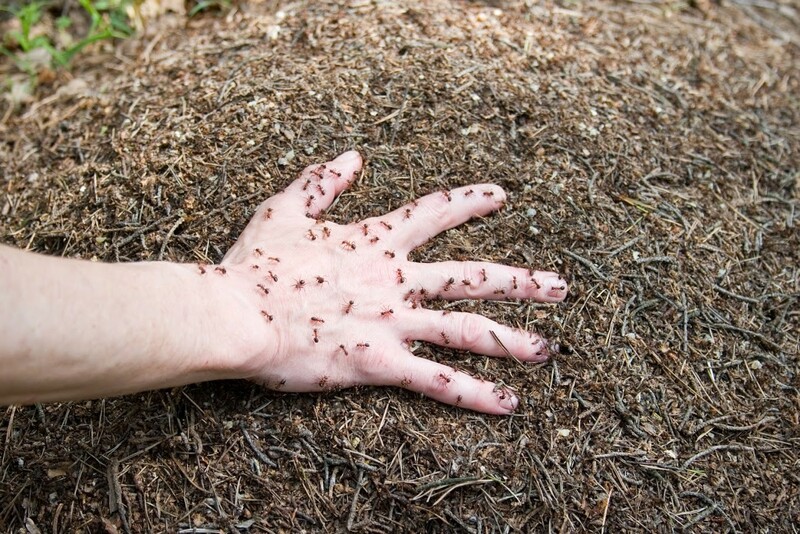 That way, your pest control specialist can lay traps or bait right along the trail for the ants to find. Ants are interesting insects, but you don't want them in your home. If you have an ant infestation, contact a pest control company in your area for help getting rid of them.